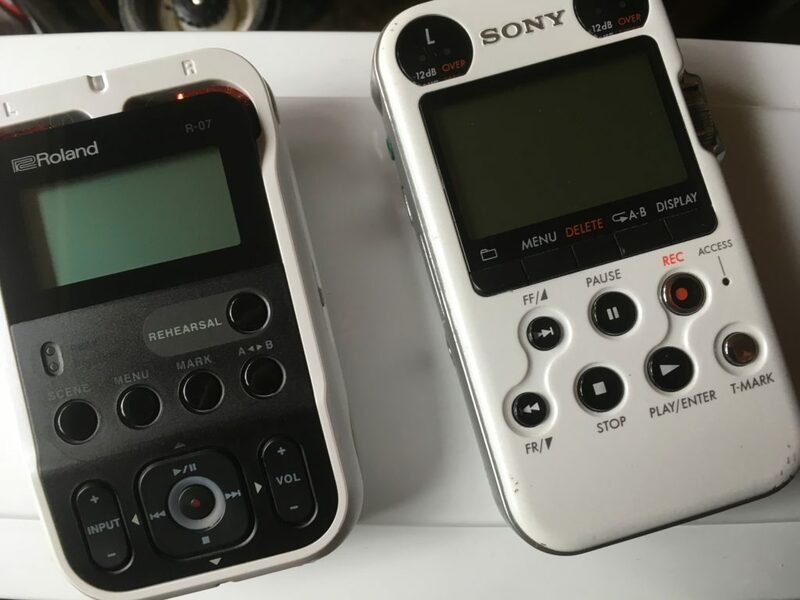 I like many, was saddened when it came to light that the Sony M10 handheld recorder was being discontinued. The incredibly portable machine has decent mics, batteries for days, and a formfactor that allows it to be carried almost anywhere. In the year or two since it’s discontinuation, sound professionals have been waiting and wondering if there was a successor. 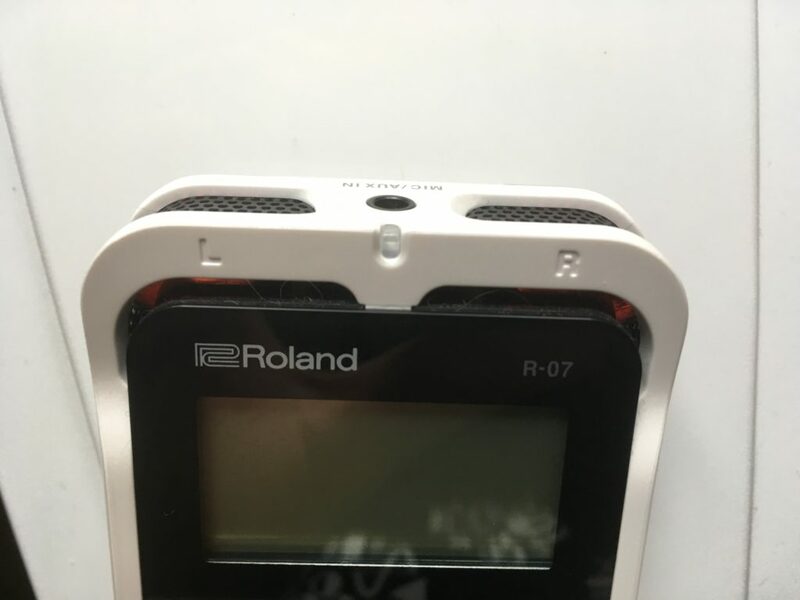 When Roland announced its R-07, I don’t think I was the only one that thought we had finally gotten one. Soon after its delayed release, I grabbed it. While I don’t think its exactly on par with a Sony M10; with some caveats it is an acceptable replacement. The Roland R-07 used in this article was purchased by myself for my own personal and professional use. No demo unit was provided to me by Roland or other third party. This is not meant to be a full review, with downloadable files and RX screenshots and the like. This is an informal comparison between two handheld recorders I own. The most important thing by far is: does it sound as good as a M10? The answer is: “yes” but with the caveat “watch the wind protection”. In my AB tests the R-07 has a bit more high end in the recordings but not a drastic amount. These examples are being played through Soundcloud so some detail will be inaccurate to source recordings. This example was taken in my front yard in Redmond, WA during a light drizzle in early June 2018. It’s difficult to tell in this Soundcloud version but in the source files I can hear how the R-07 picks up more of the drizzle. In both examples you can hear the distant traffic for better or worse. The R-07 does fall apart in a blow test where I blow on each of them at the same time. One of the advantages of the M10 has always been the fact that you don’t need additional wind protection. I obtained these examples by holding the recorders back to back like a sandwich so that they were as close to eachother and the source as possible. I then swapped the channels of the M10 so that the stereo image would be the same (and not flipped) as the R-07. They were recorded at 96/24. It feels damn good. It’s smaller than the M10, and doesn’t have the easily knickable glossy finish. Has fewer buttons on the back for REC LEVEL and Speed Control to accidentally get switched on in your pocket to screw you up. I often have the R-07 in my right front pocket with my keys and forget it’s there. (Those in skinny jeans may have a different experience). The M10 for me was just a bit too big to be a front pocket fella. The Roland fits in the hand nicely and your thumb has access to all the controls, such as they are. The overall construction feels solid and sturdy. I think the R-07 comes out ahead of the M10 here. The plastic feels like a higher quality and not susceptible to any creaky handling noise that can occur with the M10 or other contemporary handhelds (I’m looking at you H4 and H1). I got the white one (as you’ve noticed from these images) and it looks real nice. -A big selling point to the general audience will probably be the smart phone app integration. I have used it very little but it is obvious some of my below issues exist because it is “solved” in the app integration. The app seems serviceable but I don’t plan on using it outside of a few select scenarios, but not day-to-day. -Recording enabling and initiating on the R-07 is much more intuitive and easy to see. On the M10 you must hit the record button then hit the Pause button that is pulsing a faint amber. Many a recordings of mine do not exist because I didn’t hit that dimly pulsing pause button. The R-07 you hit the Record button twice, which flashes then sustains a very bright red ring, which is easy to see in daylight conditions (or what passes for daylight up here in Redmond). -Unlike with the record button: the rest of the control panel is dark with very small text which in anything but bright conditions will make the control text difficult to see. Contrast this with the easy to read text and buttons on my M10 makes this an obvious poor design choice. -Battery life on the R-07 isn’t immortal like the M10 seems to be. I don’t have hard numbers but anecdotally the R-07 hanging out in standby mode (with Bluetooth turned off) lasts only a few days, rather than weeks of the M10. 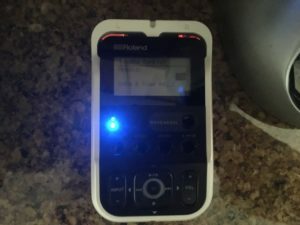 R-07 does support the ability to be powered (but not charge) via it’s USB port, which is not trivial for those of us already carrying battery banks on trips for phones and other recorders. -Informally, the boot times of the two devices are almost identical. On my machines they both clocked in around 15 seconds to boot and read the same model 32GB microSD cards. -USB connecting to a PC via a powered HUB results in “SD CARD NOT FORMATTED” error. I have had USB connection recognition on 2 tower PCs and a Thinkpad laptop. -Troubleshooting the above USB connection issues by turning off the device; once set the “OFF” text to keep displaying past its 3-5 second period for instead minutes until the batteries were removed. -Getting the microSD card out of the top flap is also painfully difficult on the R-07 opposed to easy on the M10. The entire slot is recessed pretty far into the back so the “press in to unlock and slide out” mechanism does not give you enough purchase on the card to get ahold of it. Even grabbing the raised lip of the bottom part of the microSD card with your fingernail to slide it out doesn’t work. My only success has been to do the “push in and let go real fast so the card launches a few inches out of the recorder” method. In putting together this review I tried a few different techniques to make sure I am not simply a luddite but in fact was able to accidentally launch the microSD card across my living room. Fortunately on sparse wood floors, I was quickly able to find it. Had that happened in the field then the result could have been disastrous. -This one is a pretty big failing and makes it obvious that Roland expects you to use the smart phone app: Changing Input volume via “+” and “-” face buttons is not as quick or helpful as the wheel on the M-10 as you have to wait for the numbers to tick up or down, rather than turn a wheel and be there. Additionally: when you alter the volume this way the meters on the device are no longer visible and as such- it is even harder to dial in the volume you would like. You have to adjust the abstract “INPUT” number from 0-100 and wait for the number display to go away and see if your input volume is close. This has been an issue for me quickly grabbing opportunistic source, and foresee causing future frustrations. The smartphone app has an INPUT slider that allows you to still see the input signal from the meters and I expect this is why it is not as easy to use on the device. -Bluetooth LED light on the front of the device is incredibly bright. In low-light situations it makes it even harder to see the other controls and non-backlit screen. Though I suppose if you have Bluetooth enabled you may be looking at your phone anyways. -Gap in the front face of the recorder above the screen where the mics are located is well-suited for grabbing and trapping dirt and lint. Do you need a handheld recorder? Then probably get it. M10’s on eBay aren’t getting cheaper. Do you already have a M10 or similar in quality handheld recorder? Then probably don’t get it and hope a Roland R-07 revision fixes some of these issues before you need a replacement. Great review thanks! I am considering one of these as my first recorder or the Sony ICD-SX2000. Which would your recommend? Or are they entirely different beasts? 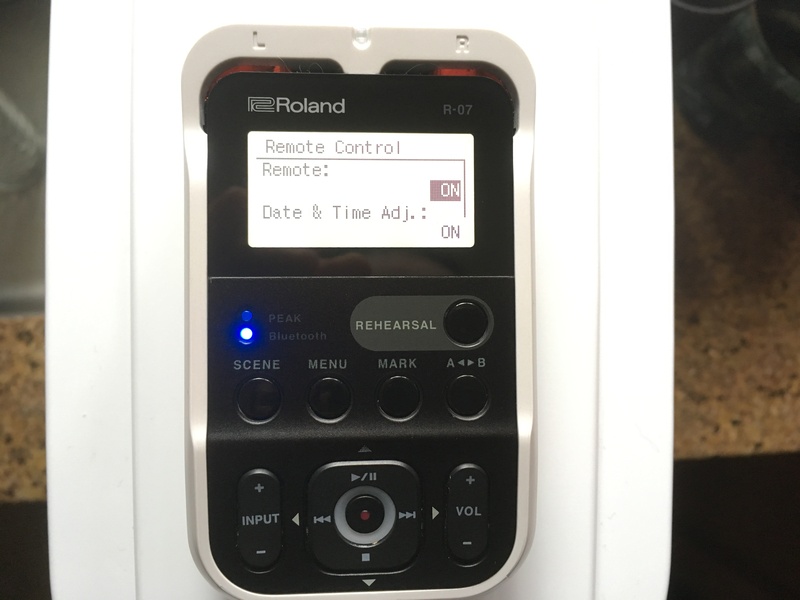 Ideally I am looking for something that will be suitable for recording field sounds, rather than for gigs and live performance, is the R-07 still up to this kind of activity? The ICD line is more for voice memo and not really suited for sound effect recording. I would look into the Roland or a Zoom for your first recorder. There’s a nice little feature of the R-07 that wasn’t mentioned; the mics tilt slightly upward. It may not seem like a big thing, but it makes a difference when all you have is a table and no tripod. While I know you can change the settings of the scenes, can you also change their default name too? Do you know why I can’t find any comparisons between the Sony PCM-D100 and the Roland R-07 ? I am especially interested in the quality of the sound recorded for very quiet sounds in field recording? I used to use a Sony Minidisc which had very good low noise and great for recording quiet sounds, and am looking for a small portable recorder that will be at least as good in quality of the sound without hiss.